Information about consulting the catalogue. Historic, Heraldic, Genealogical, Nobiliary, Bourgeois, Etymological and Knightly searches. Noble titles, Arbitration sentences, Adoptions, Surveys, International Nobility Register, Registration with the Italian Heraldic Council. 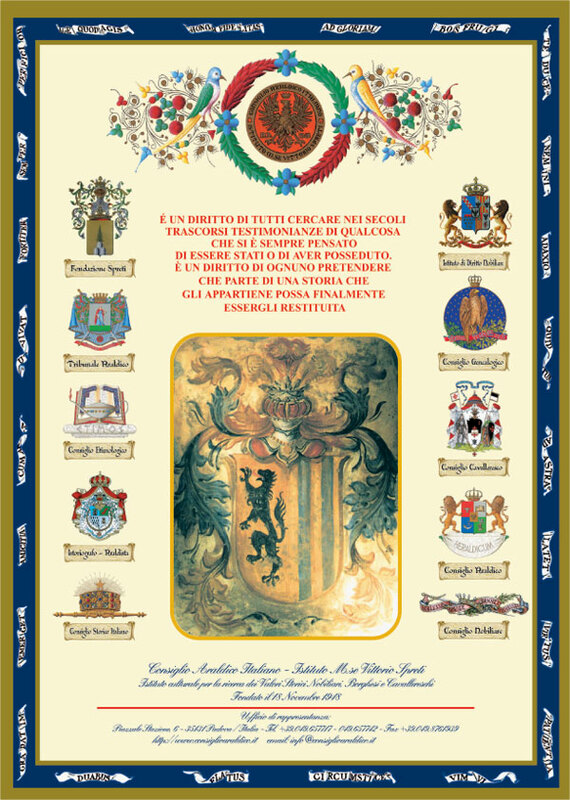 Coats of arms: Personal, Noble Houses, Bourgeois, Citizenship, States, Regions, Provinces and Municipalities, Ecclesiastic Dignities, Sovereign Houses, Dynasties, Knightly orders, Military Orders, Public and Moral Boards, Religious, Artistic and Masonry Associations, Arms of Italy, Companies, Associations and other types with Notary Registration and publication in the Official Gazette. Personal portraits, wax seal rings, marble and wood sculptures, decorations and flags, cloaks, seals, jewellery, writing paper, manuscripts, furnishings. Antique original arms and modern reproductions: armoury, swords, helmets, coats of mail, shields, halberds, etc.